After completing the necessary registration formalities at Marangu National Park gate, we transfer to Rongai. The climb begins from Nale Moru (1,950 m) on a small path that winds through fields of maize and potatoes before entering pine forest. The track then starts to climb consistently, but gently through attractive forest that shelters a variety of wildlife, including the beautiful Kilimanjaro Colobus monkey. These monkeys are black with a long ‘cape’ of white hair and a flowing white tail. The forest begins to thin out and the first camp, Rongai One, is at the edge of the moorland zone (2,600 m) with extensive views over the Kenyan plains. The trail continues up towards Kibo, passing Second Cave en-route, and reaching Kikelewa Cave at 3600 meters. From here the views start to open up affording expansive views of the summit. Spend the night at Kikelewa Cave. A short but steep climb up grassy slopes is rewarded by superb all-around views and a tangible sense of wilderness. We leave the vegetation behind shortly before reaching the next camp at Mawenzi Tarn (4330 m), spectacularly situated directly beneath the towering spires of Mawenzi Peak. The afternoon will be free to rest or explore the surrounding area as an aid to acclimatization. We will spend an extra day at Mawenzi Tarn to acclimatize. We will be able to trek and explore around Mawenzi Tarn and also rest to ensure readiness to continue our trek up Kilimanjaro tomorrow. We cross the lunar like desert of the ‘Saddle’ between Mawenzi and Kibo Peaks to reach Kibo campsite (4750 m) at the bottom of the Kibo crater wall. Spend the afternoon resting for the final ascent to the summit. We will wake around midnight to begin our ascent to Uhuru Peak. The first section of the trail consists of a rocky path to the Hans Meyer Cave. We then take on switchbacks up to Gillman’s Point at 5681 m, situated on the crater rim. This section is very steep with much stone scree and is the most demanding section of the route. From Gillman’s Point we hike for another two hours up to Uhuru Peak (5895 m), the highest point in Africa. You made it! We enjoy a short time on the Roof of Africa before beginning our descent. We descend back on the Marangu Route, passing through Kibo Hut and then onto Horombo (3720 m), where we will spend our last night on the mountain. We enjoy our final dinner and a well-earned sleep. 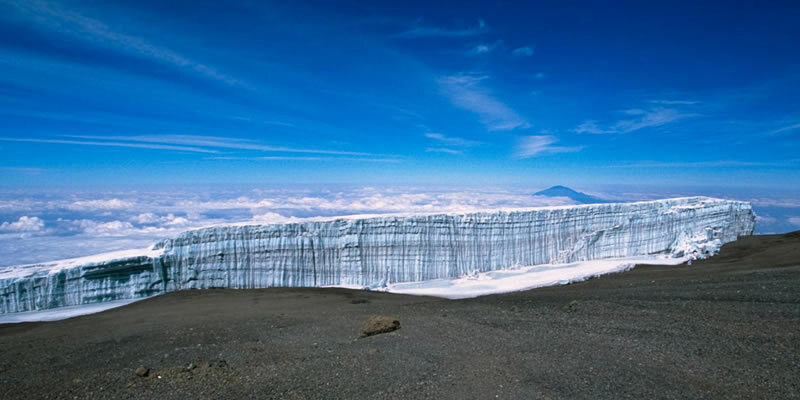 After breakfast we continue our descent, passing Mandara Hut down to the Marangu Gate (1842 m) where you will receive your summit certificates courtesy of the Kilimanjaro National Park Authority. You will be met by a vehicle to transfer you back to your hotel in Moshi town.